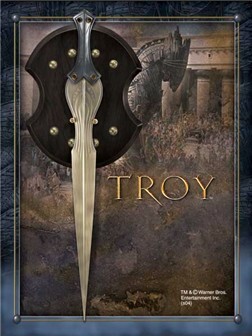 The Achilles sword from the movie "Troy" and wielded by (you guessed it) Achilles (a younger Brad Pitt) may not have had any historical precedent. No real surprises there, it is Hollywood after all. But you have to admit, it looked kind of cool..
And at least, despite it being a fantasy sword - with it's riveted hilt and brass, leaf shaped blade it was at least slightly historically plausible (though if you are interested to see what kind of sword Achilles and other Greek warriors ACTUALLY used, you'd be best off to visit our Ancient Swords page). The original licensed replica of the Achilles sword was made by the Noble Collection was bronze plated stainless steel, weighed a hefty 3.2 lbs - but was of course, a wall hanger - and typically selling for $195 and up, a very expensive wall hanger at that! 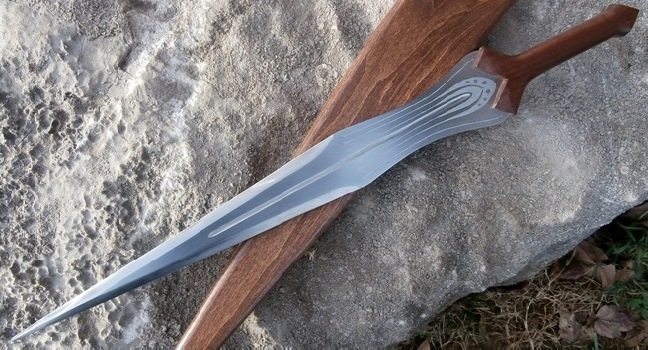 These days, it is impossible to find the original - what passes for an Achilles sword now is a cheap, nasty looking replica (the original was classy, the $50 to $100 knock off's - not so much). However die hard fans of the movie and the general concept of this sword are in luck. USA based sword maker Scorpion swords has a WICKEDLY functional replica of this blade made from 1095 beautifully tempered steel with a full tang sandwiched between quality walnut wood - well, JUST LOOK AT IT! The thing is just a beast - and best of all it is totally functional and just $70 more than what the wall hanger version used to cost..! I hope this information on the Achilles Sword has been helpful. To return to movie replica swords from Achilles Sword,click here.